Take advantage of the watchlist for quick access to your favourite listings. To use the watchlist, please sign in. Save your search requests and start them again at any time with just one click. You will be informed by e-mail when new listings appear on your saved searches. In order to save your searches, you must be logged in. This is your own listing. Save interesting vehicles to your personal watchlist. Create and save individual searches. NL- Helemaal in het zuiden van California aan de Mexicaanse grens heb ik deze zeer mooie eerste editie Corvette C3 bouwjaar 1968 gevonden. De Corvette 1968 is het model met de chrome bumpers. Een dikke V8 motor 350 ci met 4 speed manuele versnellingsbak.Een vette sound en perfect rijgedrag. FR-Dans le sud de la Californie à la frontière mexicaine, j'ai trouvé cette très belle première édition Corvette C3 année 1968. La Corvette 1968 est le modèle avec les pare-chocs chromés. Un gros moteur V8 de 350 avec boîte de vitesses manuelle à 4 rapports, un gros son et une maniabilité parfaite. ENG-In the south of California at the Mexican border I found this very nice first edition Corvette C3 year 1968. The Corvette 1968 is the model with the chrome bumpers. A big V8 engine 350 ci with 4 speed manual gearbox. A fat sound and perfect handling. D-Im Süden von Kalifornien an der mexikanischen Grenze fand ich diese sehr schöne Corvette C3 Baujahr 1968. 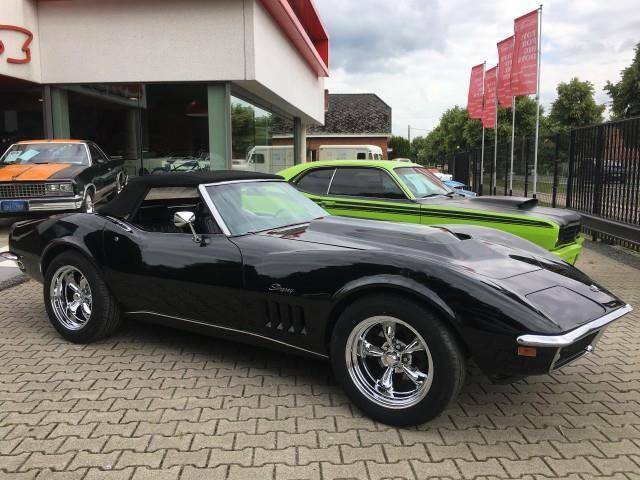 Die Corvette 1968 ist das Modell mit den Chromstoßstangen. Ein großer V8-Motor 350 ci mit 4-Gang-Schaltgetriebe, ein fetter Sound und perfektes Handling. Here you can individually choose the currency in which all offer prices should be displayed. This setting can be changed at any time. Conversions are generated once a day. The illustrated non-EUR-price are approximations and commercial roundings. Legally, these conversions are not binding. Please select from the following payment options and enter the details required. I authorize Classic Trader GmbH, Am Borsigturm 53, 13507 Berlin, creditor identification number DE81ZZZ00001454093, to collect recurring payments from my account by direct debit. At the same time, I instruct my bank to redeem the direct debits you have made to my account. Note: Within eight weeks of the debit date, I may request reimbursement of the amount debited. The conditions agreed upon with my bank apply. Should you have any questions, please feel free to contact us at +49 30 437 75 19 20. Yes, please keep me informed via e-mail about polls, news and offers from Classic Trader. This consent can be revoked at any time with effect for the future. What should be included in the print exposé? Your data will only be transmitted to Classic Trader, not to the seller. With Classic Trader your vehicle is as good as sold. We support you along the way. Post an unlimited number of vehicles. Use Classic Trader as a professional distribution channel and benefit from our services. You already have a Classic Trader account? Login here.